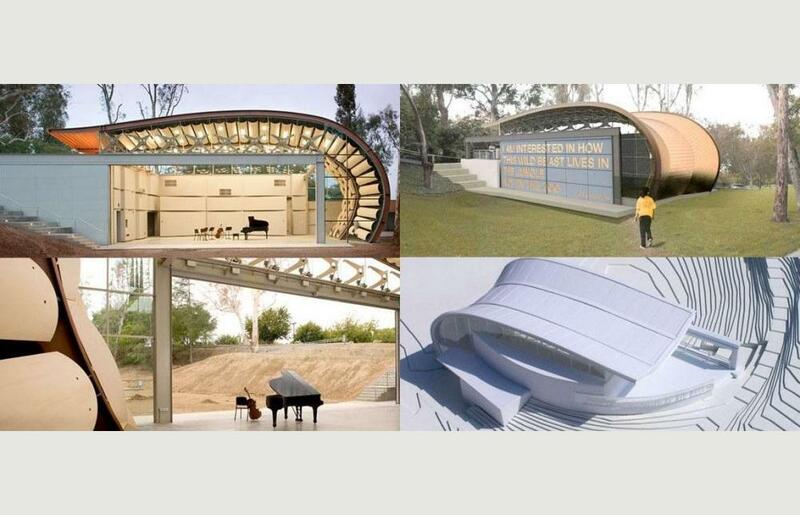 The Wildbeast Music Pavilion is a multi-purpose performance space, able to be quickly transformed from an indoor classroom and recital hall to an open-air orchestra shell. Dedicated to the avant-garde composer Morton Feldman, the pavilion takes its name from his observation, “I am interested in how this wild beast lives in the jungle, not in the zoo.” Its form from the elegant, but minimal musical strategies employed in his compositions. 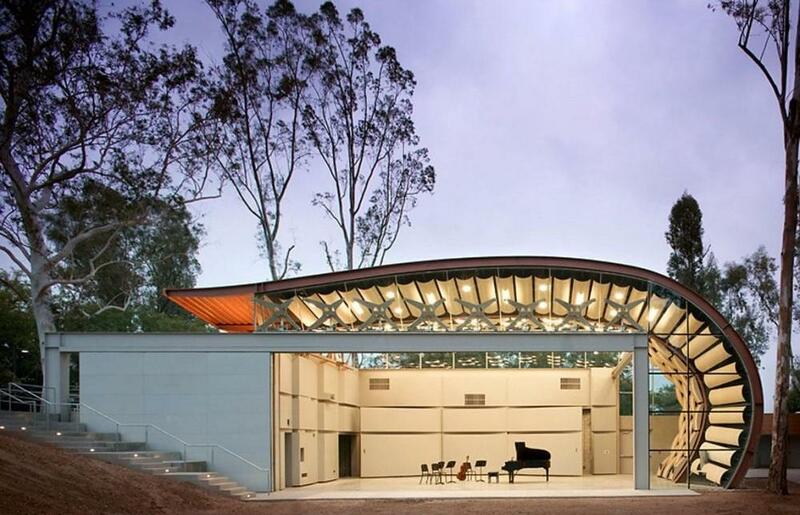 Created in response to the Cal Arts rapidly growing music curriculum, the pavilion is expected to accommodate an average of two instrumental recitals daily, and serve as a performance venue for two to four performances each week during the school year. The facility has an audience capacity of 120 in recital mode, ample chair storage, and a fully humidified and conditioned instrument storage space. 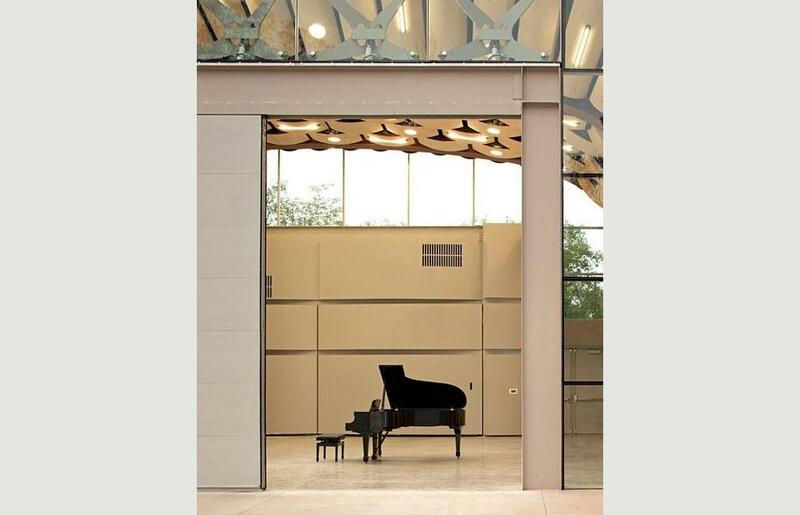 As a music classroom, the pavilion provides recording and playback functions. 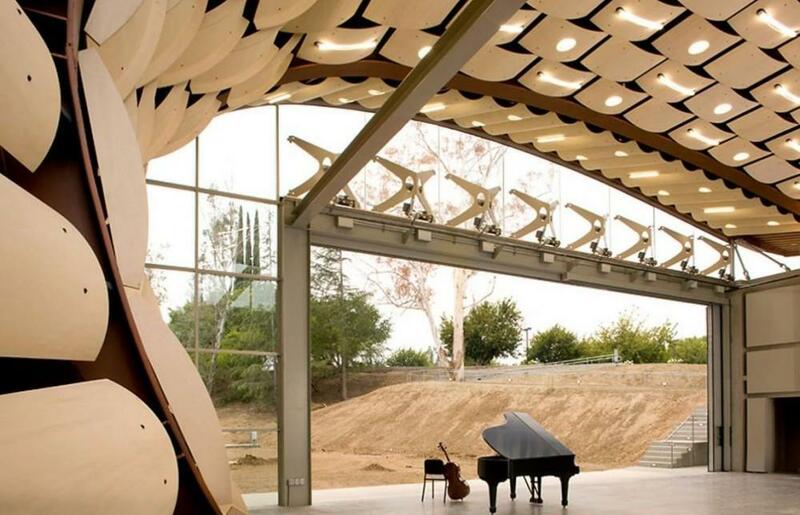 With a profile that is curving and slender in contrast to the orthagonal presence of neighboring structures, the pavilion opens to a nearby eucalyptus grove and a sheltered glade which provides space for casual seating during performances. 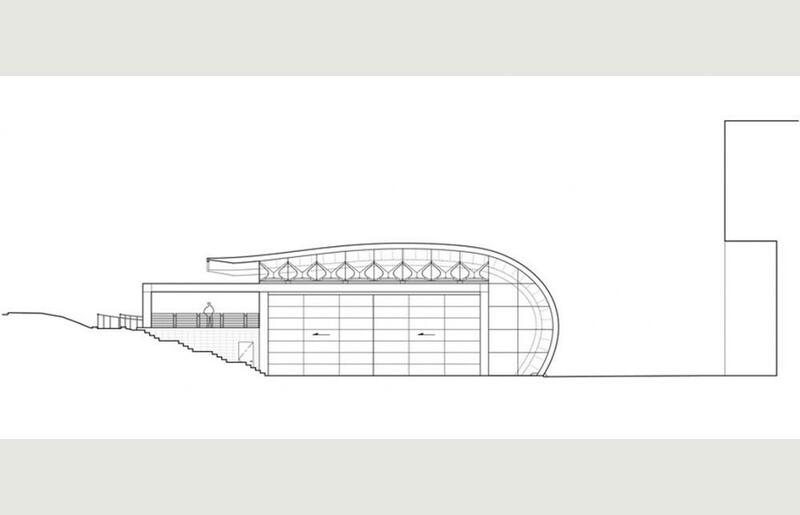 Access is provided via a long, sinuous ramp which negotiates the spaces between tall trees to open first to an elevated reception area, and then to the upsweeping curve of the roof which shelters the artist’s entrance. 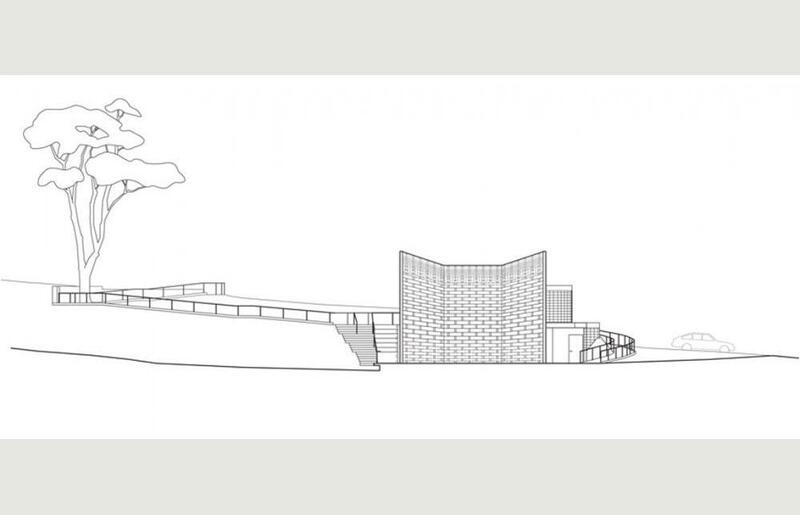 The front wall of the building slides open, transforming the interior space into an open-air performance stage, while a folding glass awning helps to project sound to the audience. 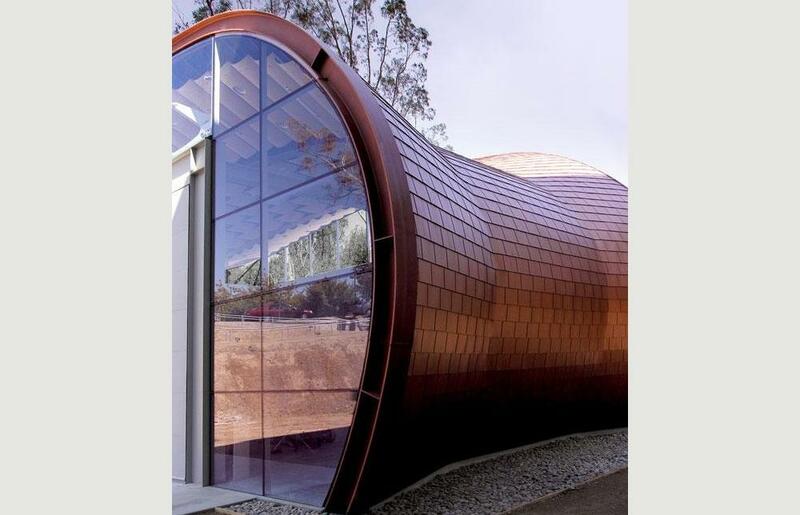 Hodgetts+Fung drew on their experience with performing arts venues and unconventional materials to create The Wildbeast’s elegant, sculptural architecture. 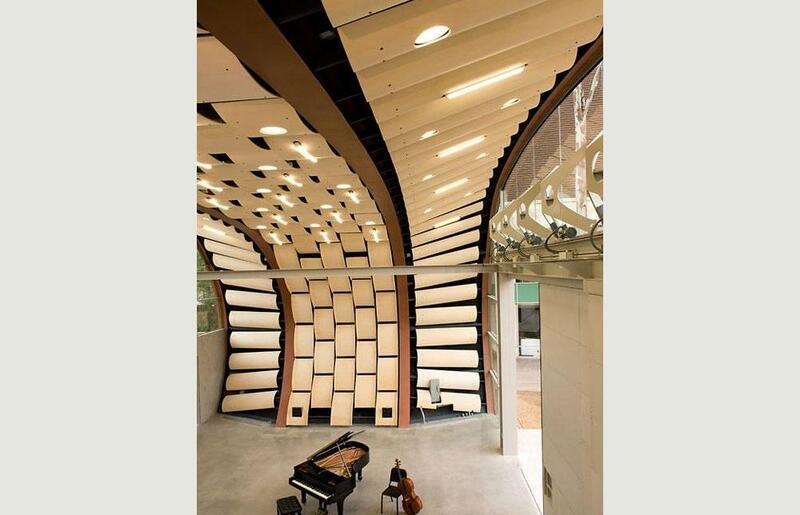 The team’s acclaimed projects include the most recent renovation of the Hollywood Bowl, the 110-acre performing arts center and amphitheater for the Minnesota Orchestral Association and the temporary fabric roofed Towell (Powell Temporary) Library at University of California Los Angeles (UCLA). In addition, Craig Hodgetts, a founding associate dean of CalArts’ School of Design in the early 1970s, had a special affinity for the site. 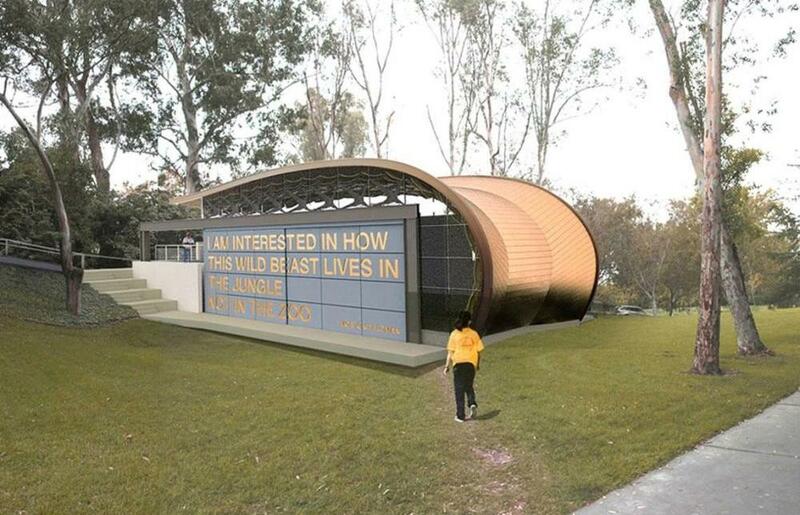 “The initial image for The Wildbeast came from a fabric building,” Craig Hodgetts said. 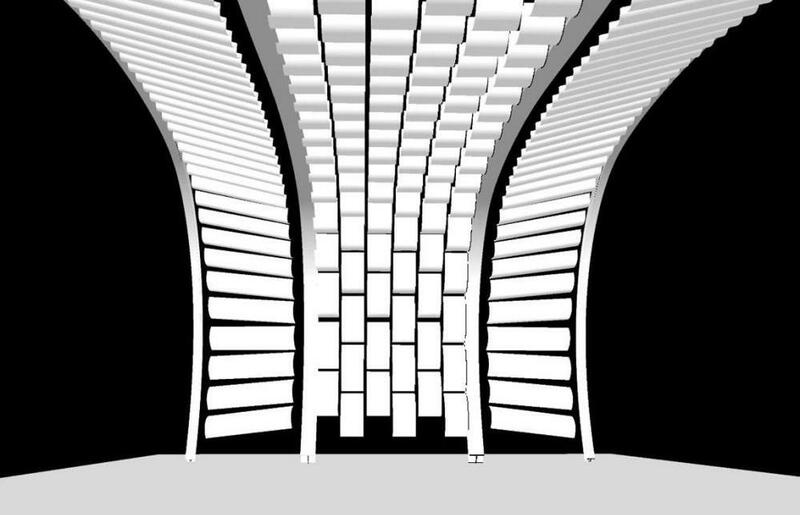 “We wanted to make it buoyant, feminine and curvaceous– a counterpoint to the geometric forms of CalArts’ massive five-level structure. The engineering challenge was to convey a lyrical light-weight quality while using cement and steel. 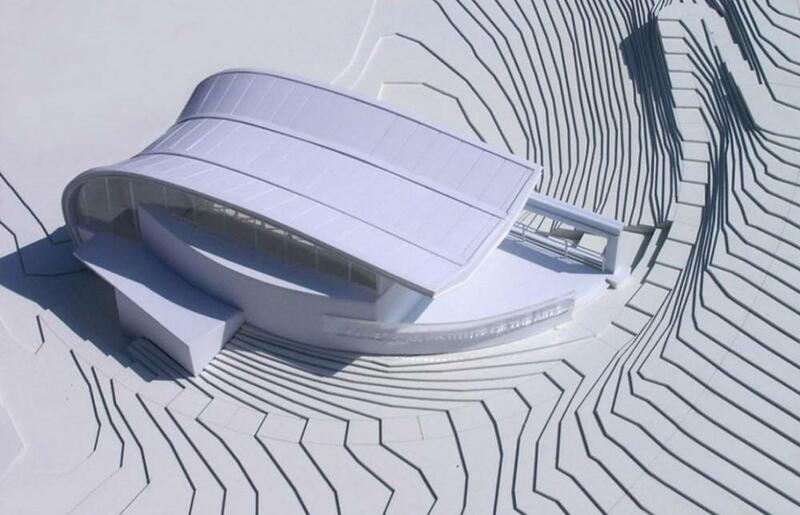 We worked with structural engineer Bruce Gibbons and Chris Kahanek of Thornton Tomasetti Group to determine the most efficient skeletal form.” Described as a “mini Hollywood Bowl,” when the front wall is rolled open, the acoustically sophisticated structure becomes the stage for a natural amphitheater. 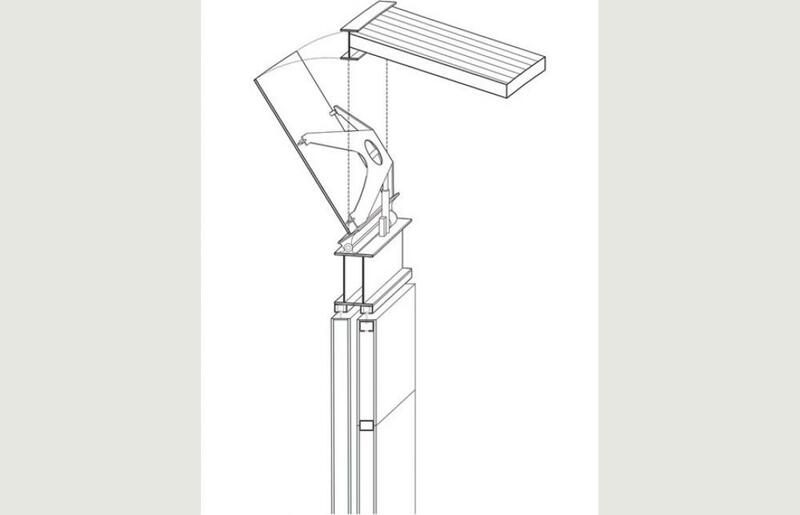 In this outdoor performance mode, sound is projected from the building’s curved back wall and focused by front windows that pivot to become acoustic awnings above the stage. 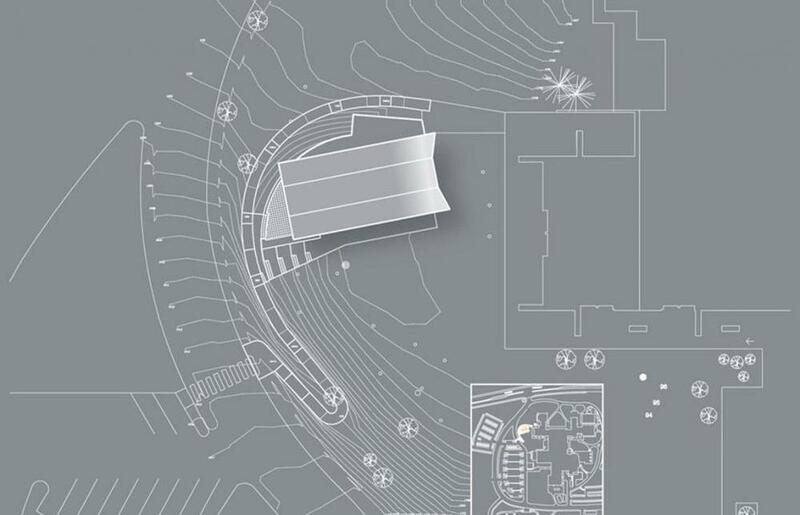 In addition, The Wildbeast houses a permanent state-of-the-art 5.1 surround system.